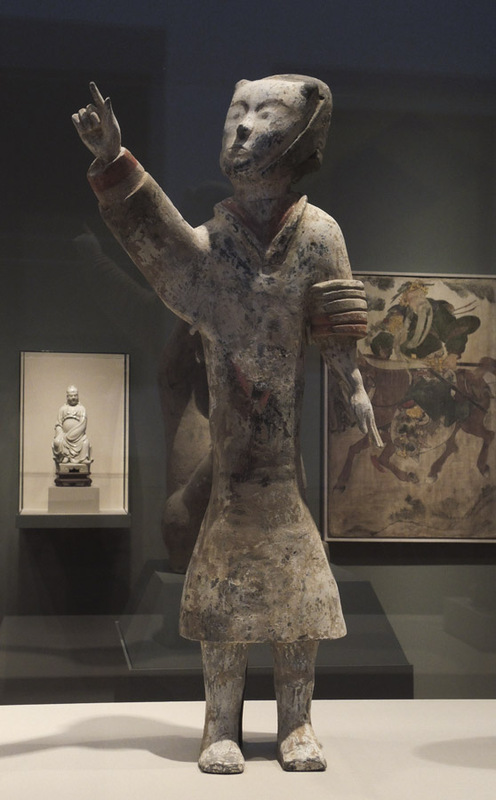 Tomb Figure of an Entertainer, Eastern Han Dynasty, China, ca. 25-220; gray pottery with remains of pigments. This fellow would certainly enliven the afterlife; it's no wonder a powerful person wanted him in his tomb. 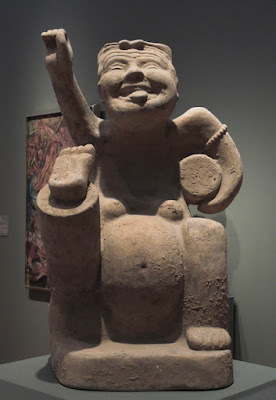 Seeing a figure like this is one of the reasons I love going to small museums that are new to me: there are always delightful surprises. I recently visited the Davis Museum of Wellesley College––I wrote about a Kathe Kollwitz show there––which had a mixed group of works from all over the world, very loosely tied to a theme of "Stories, Ideals, Beliefs". 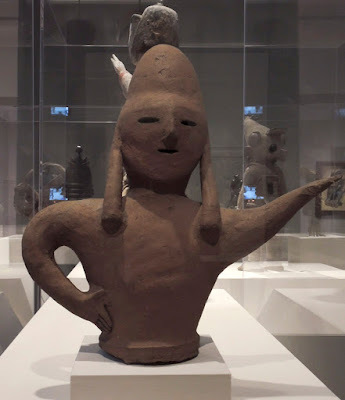 So this post gathers the images of objects depicting the figure that tickled my fancy, without a strong theme uniting them. 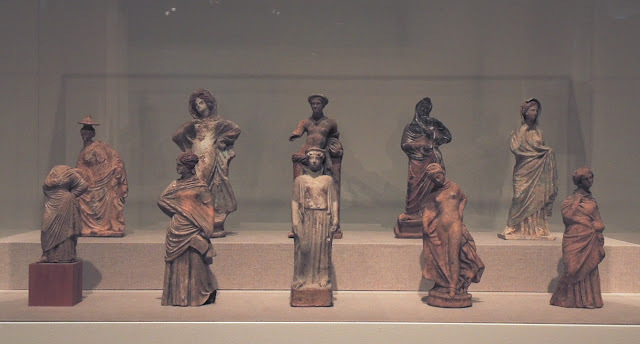 Tanagra Figures, Greece, 3rd century BCE; terracotta. These small figures have a range of gestures, some quite natural, some classically reserved. I love the saucy hands on hips attitude. 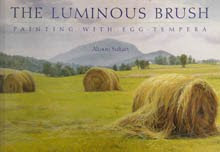 From the museum label I learned that these works were highly coveted when they were discovered in the late 19th century. Unfortunately, there were a lot of forgeries, but the label doesn't indicate which pieces in this display are genuine and which are fakes; I couldn't begin to figure it out. Haniwa Tomb Figure of a Soldier, Japanese, ca. 300-710; earthenware. Tomb Figure of an Astronomer, Chinese, Han Dynasty, 206 BCE - 220 CE; gray pottery with pigment. .....while an astronomer points to the stars. 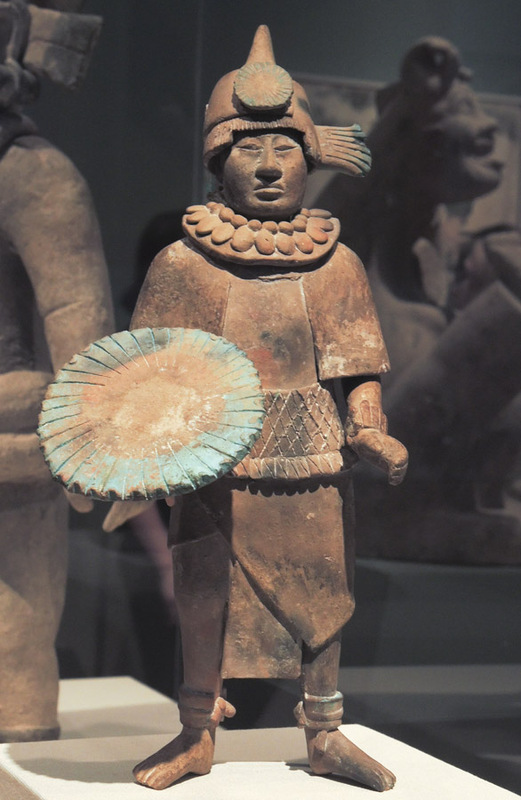 Standing Noble with Feather Shield, Maya, ca. 700-900; earthenware with paint. Beautifully idealized form enhances the proud stance of this figure, whose shield has the appearance of a large flower. 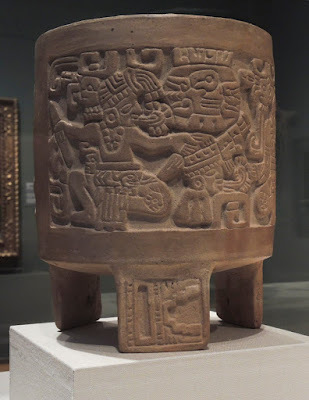 Tripod Vessel with Ballgame Scene, Maya, Early Classic, ca. 400-700; burnished ceramic. 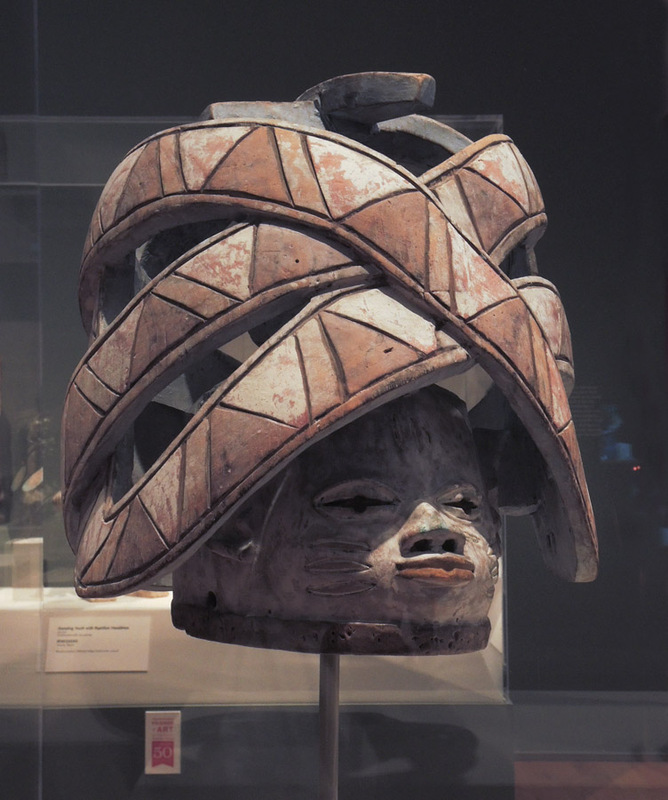 This vessel has a very different kind of stylization from the noble above, one much more based on dense pattern. 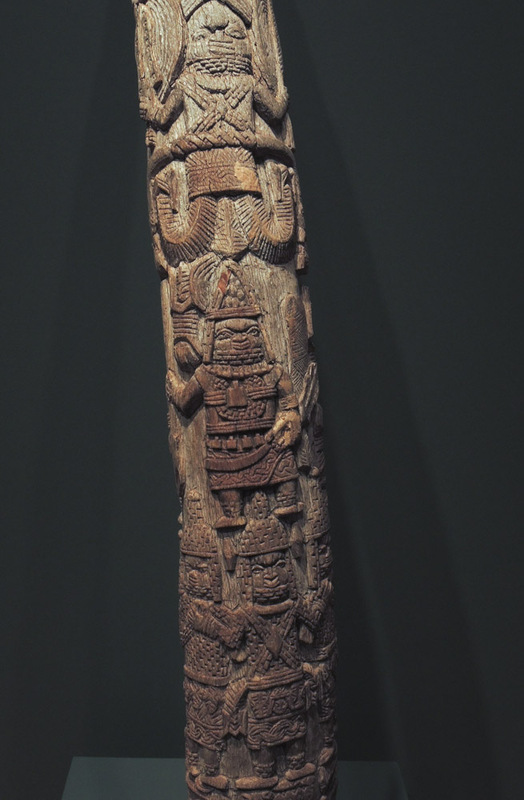 Tusk for the Royal Benin Ancestral Shrine, Igbesanmwan Carvers Guild, Benin City, Nigeria; ca. 1851-88; ivory. Elaborately adorned figures climb the cylindrical column. Corbel with a Green Man, French, 1210-40; limestone. 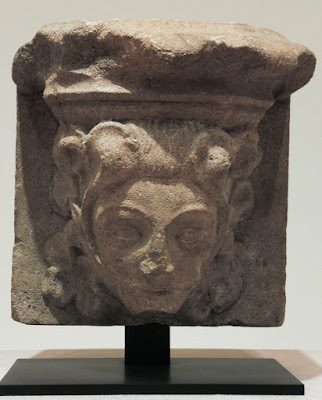 From Wikipedia I've learned that a Green Man is a depiction of a face surrounded by leaves; it's a symbol that exists in many cultures, and across hundreds of years. Capital, (Musician Playing a Vielle), French, ca. 1125-1150; limestone. 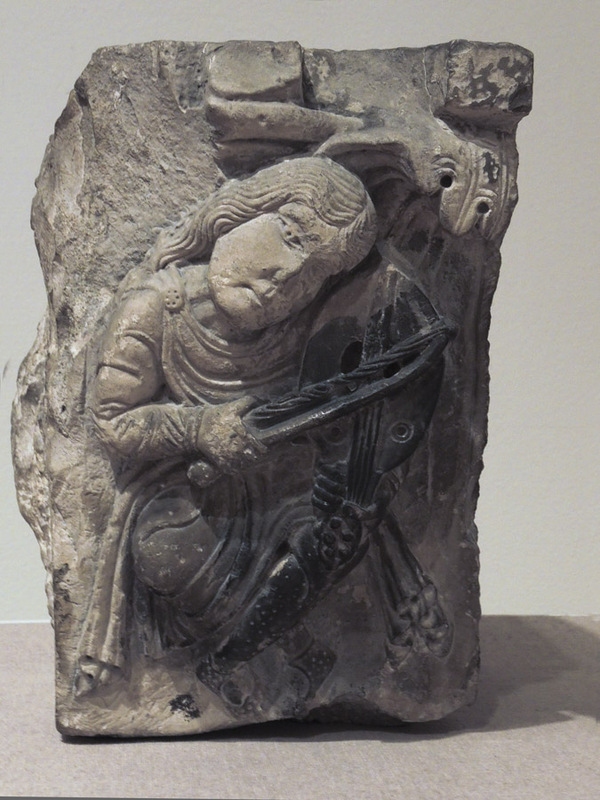 Here's another wonderful medieval architectural ornament, with a man soulfully playing his stringed instrument. Gelede Mask, Yoruba, Nigeria, 20th century; wood. primal creative force of women. 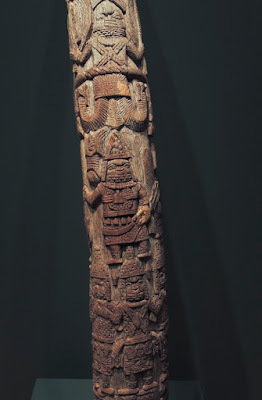 The Gelede spectacle venerates female elders and is dedicated to Iya Nla, the maternal principle in the Yoruba cosmos, who unites culture with nature and the sacred with the profane. 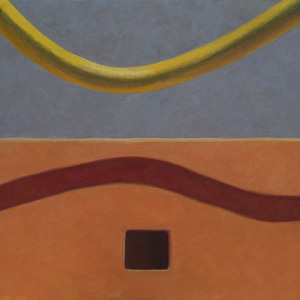 We can think of great art as having some of those magical properties.